This healthy lasagna uses zucchini 2 ways! 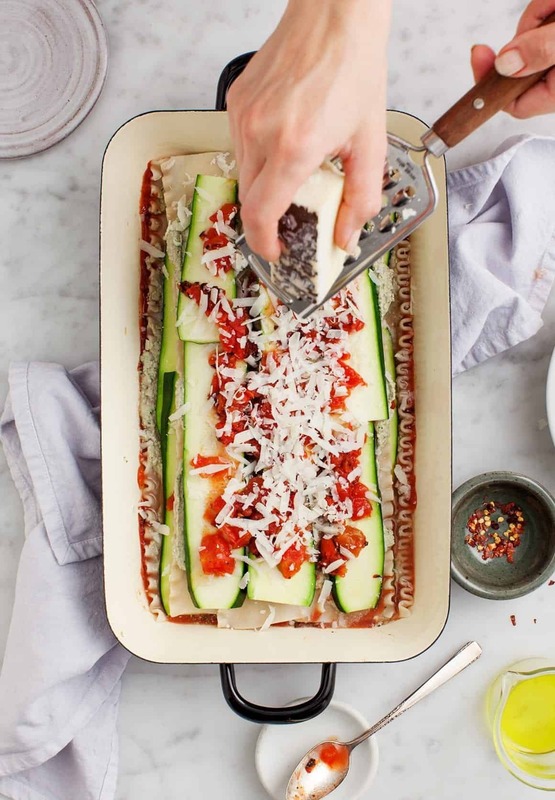 Zucchini is blended into the creamy filling and zucchini planks are layered into the lasagna itself. It’s back to school season and even though no one in our family is going back to school (although how cute would doggie lunchboxes be!? ), I still wanted to share an easy recipe that would be great for a busy weeknight. Everyone loves lasagna, so I put it on my “to make for September” list. My plan was to use the last-surviving summer vegetables, particularly zucchini since it’s still growing rampant. Instead of using regular ricotta as the filling, I would make a healthier ricotta. Maybe I’d even blend a vegetable to make the ricotta filling. And then I realized – oh wait, I have this Zucchini Lasagna Recipe in THE COOKBOOK that is already my favorite zucchini lasagna recipe of all time. So instead of reinventing the wheel, here’s the wheel! This is no ordinary zucchini lasagna recipe. Here’s why! First off, this zucchini lasagna recipe uses a BUNCH of zucchini. Planks of zucchini layer in to replace half of the noodles that you would normally need. That’s the obvious move. There is also zucchini blended up INTO the “ricotta” filling itself. 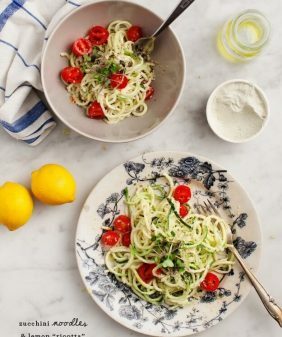 You’ll never notice it there, but the zucchini, along with blended walnuts, tofu, lemon juice, and spices creates a thick, creamy ricotta-like filling without using ricotta. Yes, I put a moderate amount of cheese on top of this otherwise vegan lasagna. To make this recipe vegan, either skip the cheese or use vegan cheese on top. If you love cheese, use extra cheese! This zucchini lasagna recipe uses zucchini two ways! Zucchini is blended into the creamy filling and zucchini planks are layered into the lasagna itself. Make the Zucchini Tofu Ricotta: In a food processor, combine the walnuts, garlic, tofu, chopped zucchini, lemon juice, oregano, red pepper flakes, basil, salt and pepper and process to a spreadable consistency. Add more salt and pepper as desired. Prepare the pasta according to the instructions on the package, cooking until al dente. Top with the remaining ⅓ tomatoes. Sprinkle with the grated cheese and drizzle with olive oil. Bake covered for 15 minutes. Uncover and bake 20-30 minutes more. or until the zucchini is tender, but still has a bite, and the tomatoes and cheese are bubbling. Let rest for 10 minutes before serving. Season with freshly cracked black pepper. To make this vegan, use vegan cheese, or skip the cheese on top. If you skip the cheese, you may want to season the lasagna a bit more salt and pepper. 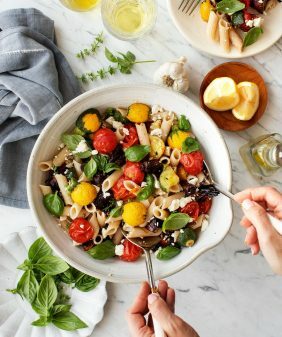 Perfect weeknight meal for September! Love the tofu ricotta! I gotta try that! Such a perfect low-carb lasagna recipe!! Cannot wait to give this a try! Oh I’m totally going to try this next week! The farmers market has been abundant with zucchini. I have never had pecorino cheese before. Is it available at most grocery stores? you should be able to find it at any grocery store – otherwise you can use shredded mozzarella! Should your answer not be, you could use parmesan, asiago or manchego or other similar cheese instead? Mozzarella has a completely different texture and most important, lacks taste compared to pecorino or other similar grating cheeses, and of which would result in the finished dish tasting very different than intended. The recipe will work with any cheese you like to put on top. It’s only 1 cup of cheese on top and it’s not the main flavor in the recipe (the filling is). Mozzarella sounds amazing on top! This recipe sounds so delicious and really healthy. I was wondering, my husband doesn’t tolerate soy, is there another substitute besides Ricotta cheese that is just as healthy? Thank You! Hi Marissa, I think Kite Hill makes a nut-based ricotta that could possibly be subbed in here instead of the tofu. Ok where can I find that? Does Whole foods or Wegmans carry it? Thank You! I want this for dinner! Yum, yum yum!!!! this is looks so pretty and fresh and delicious!!! 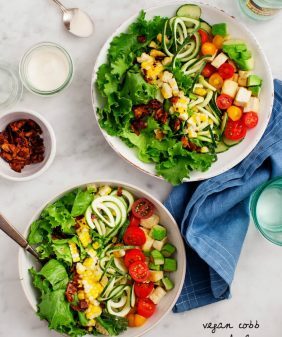 We have SO MUCH zucchini, so this recipe is perfect! Sounds fantastic … do you per chance have nutritional info per serving? Yum! That looks so delicious! This looks gorgeous! So excited for zucchini to be back in season here in NZ. I wonder – do you know if your book is available here? Would love to have a browse. I woke up craving something like this- It must be meant to be (for dinner tonight)! I’m giving it 4 stars! I used 2 cans of tomatoes- one just wasn’t cutting it for me! Wow I love this lasagna. I can’t even believe you put tofu in there. Never would have guessed. I’m pinning this for later! Thanks for sharing. what a wonderfully “lightened” lasagna recipe! Love how even the ricotta is slimmed down and “moisturized” with extra zucchini, even nice with brown rice lasagna noodles, thank you for this “reconstruction”! Wow, this was delicious! Used Kite Hill Almond Milk Ricotta and some Kite Hill Almond Milk Yogurt to replace the tofu ricotta, yellow squash instead of zucchini and a 28 oz. can of crushed tomatoes. 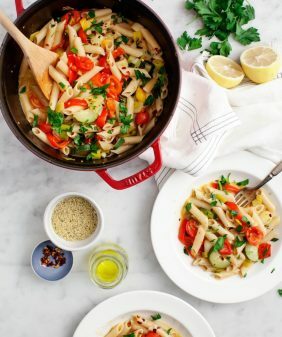 Super simple, will definitely try making this with the tofu, zucchini and fire roasted tomatoes next time! I made this exactly as is (minus the cheese) and just sprinkled a little vegan parmesan on top. It was delicious and super easy!! My boyfriend and I enjoy this with a salad, some fresh rosemary bread and wine. Perfect for a nice dinner – I’ll definitely be making this again. PS – love your cookbook by the way! So glad you both enjoyed it!! En français s’il vous plait c’est possible ? Made this and absolutely loved it! My boyfriend thought that it was even better than regular lasagna and he loves meat. This sounds awesome, I can’t wait to try!! I have a tree nut allergy – is there something you recommend I use instead of walnuts to give it the same consistency? Hi Nour, you could use extra tofu, or you could try using raw sunflower seeds in place of the walnuts. If you use the sunflower seeds, I might processes it in a blender instead of a food processor so that they become creamy. I hope that helps! I’ve made this 3 times now, I did remove the pasta, and added spinach and eggplant. I made it vegan and made my cashew cream with soy sauce. 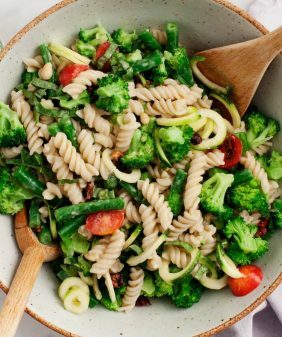 I love this recipe, so healthy and no guilt. 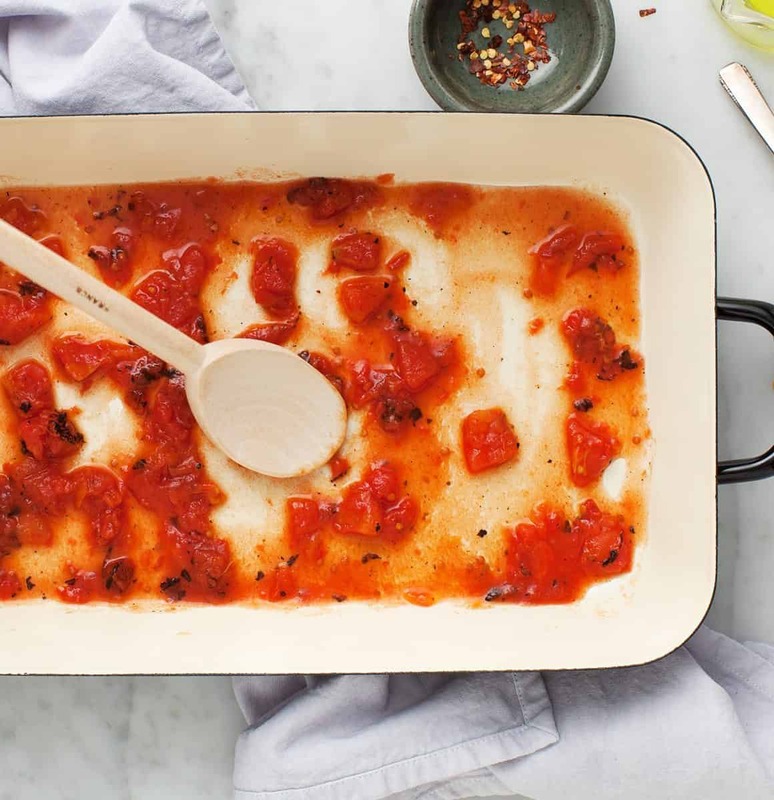 I followed this recipe exactly and it made the most perfect dinner party dish for 4. 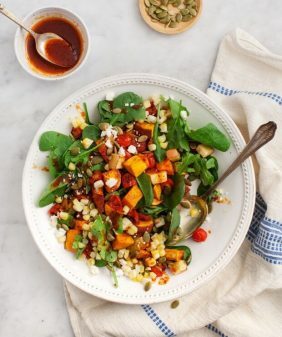 So delicious, the ricotta misctute is a revelation – well done and thank you for sharing inspiring plant based recipes that are so delicious and everyone can feel great eating. I live this recipe but felt like one can of the roasted toamto sauce wasnt quite enough. I also think Ill add another layer. Overall though I LOVED this and cant wait to make it again. I find that the tomatoes somewhat pickle the zucchini. Has this happened to anyone else before? This recipe is otherwise delicious!!! I love the tofu ricotta.